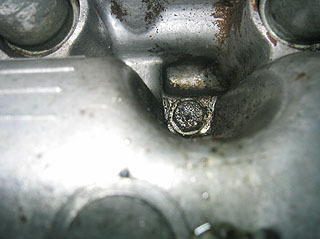 I'm still trying to get the broken bolt out of my engine. I tried drilling it and using a bolt extractor tool. It just will not move. I took the same bolt out of another engine I have. It was not easy to get got. The picture is of the bolt I took out. Most of the treads are gone. Dose anyone know what is going on here? Judging from the amount of force it took I don't thick the broken bolt is coming out.